Congratulations to your St. Francis Sharks cross country team as the girls won the team Santa Lucia division title and on the boys side the team finished 2nd and EJ Kelly won the Santa Lucia individual division title. 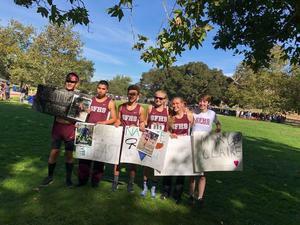 both boys and girls teams will move onto CCS November 10th at Crystal Springs. The girls team was Riley Croghan, Angelika Castro, Natalie Henn, Camryn Ryan, Isabel Meschi, Peyton, Croghan and Mary Claire Whitney. Congratulations on the first division title in school history in Cross Country. Kelly became the first division individual title and hopes to become the 2nd individual CCS champion in school history. Other boys who made the all league team were Paul Kane and Patrick McCarthy. We hope you can make it on November 10th to support our teams at CCS! Go Sharks!